Alain Prost won the Brazilian Grand Prix on his debut for McLaren, on a day when four drivers led the field and there were no end of retirements, with only nine of the 26 starters going the distance. One of those who failed to do so was Derek Warwick who held a 25-second lead and seemed to be on course for victory when the suspension on his Renault broke. As usual, the season opener witnessed a number of changes. Only 11 drivers were at the same teams they had been at the end of 1983 and there were five making their debuts, including Ayrton Senna and Martin Brundle. Of the 15 teams, all but three were running two cars, there were three tyre suppliers and no fewer than eight providing engines. 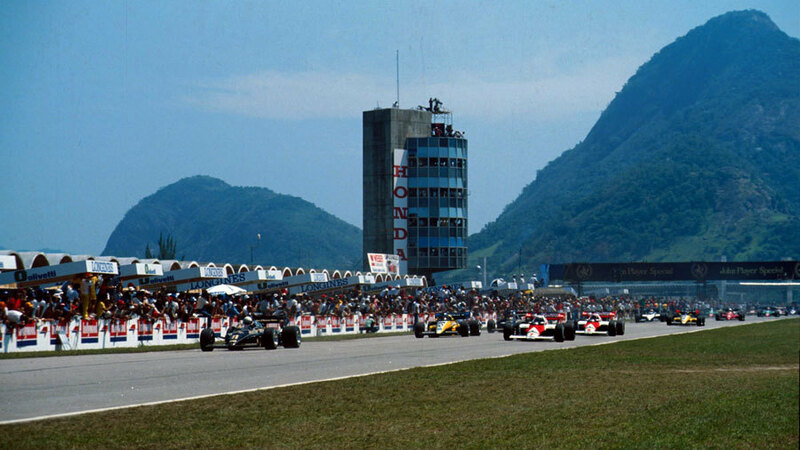 The season had a false start when Andrea de Cesaris stalled his Alfa Romeo just as the starting lights had been activated causing a 25-minute delay. At the second time of asking Michele Alboreto, who had ousted Patrick Tambay at Ferrari, led away, hotly chased by Warwick while reigning champion Nelson Piquet's Brabham spluttered into life on the grid. Alboreto led for ten laps until a locking front brake caused him to spin and soon after retire, and the lead was taken by Niki Lauda in a McLaren which had impressed throughout the weekend. He stayed in front for 26 laps until he was forced out with electrical problems. Warwick, who had earlier had a coming together with Lauda, then took over, but as the race went on the minor suspension damage he sustained in the accident started to manifest itself. Prost was closing on him lap by lap as Warwick was suffering with a front end vibration which eventually caused the front wishbone to collapse as he braked for the hairpin on the back straight. Piquet had bounced back from his poor start and had climbed back to seventh when he retired, while Rene Arnoux quit when the turbo on his Ferrari caught fire. Prost cruised to victory ahead of Keke Rosberg's Williams and the Lotus of Elio de Angelis. Tambay had seemed set for third in his first race for Renault, but he ran out of petrol on the final lap, a victim of the new ban on refuelling. He was classified sixth but that was changed to fifth when Brundle, who had crossed the line in fifth, was disqualified when it was found Tyrrell had refueled his car during a pit stop.